Welcome to Inked Moose - probably the best tattoo studio in the whole of Milton Keynes!! Inked Moose tattoo artists are covering all styles of work from portraits, cover ups, bio-mechanical, watercolours to traditional to make sure that we meet your needs. 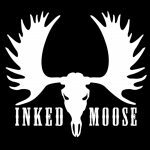 Inked Moose have a friendly, helpful environment, our idea is to deliver a professional service and very high standard of work and hygiene. Before you rush to the Yellow Pages or Offer sites to find an artist or treatment, Inked Moose Tattoo Art Studio advise to do your homework. In the hands of a skilled person, the treatments are generally safe, but there are lots of unqualified people wielding needles. Anyone considering getting a tattoo should consider an idea, size, colours and location of the tattoo as well as other factors before beginning the process. Then a semi-permanent makeup treatment from Gabriele Lase can help to transform your life and daily beauty regime. It will last for months, won't wipe off, and you will look beautiful bare-faced from first thing in the morning to last thing at night. Tattoos are no longer considered permanent and irreversible designs or marks on the skin. A variety of social, cultural and physical life changes influence the decision to remove tattoos: allergic reactions, regrets about the decision, seeking or obtaining new employment, replacing one tattoo with another one (cover up). Inked Moose tattoo Art Studio offer a wide range of piercings using only the latest equipment and techniques. Our Body Piercer is fully qualified she takes pride in every piercing she doe’s. We offer a wide range of piercings from ear piercing to dermal anchors and surface, for a full list of piercings please contact us or pop down to Inked Moose.